Createspace Independent Publishing Platform, 9781499185270, 220pp. This book is a four-generation family journey from repression and poverty in China to freedom and prosperity in the United States. 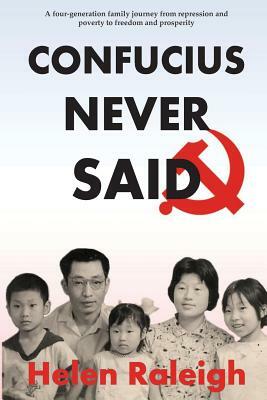 Their lives overlap with many significant historical events taking place in China, such as the founding of Communist China in 1949, the Great Chinese Famine from 1958-1960, the Cultural Revolution from 1966-1976 and the Economic Reform starting from 1980.The author recounts the enormous suffering her family had to endure under Communist China's radical social experiment. Her great-grandfather was denounced by the Chinese Communist Party and his neighbors simply because he owned land. He died in poverty, and his dying wish was never granted. Her grandfather loaned his fishing boat to the Communist Party, and ended up losing his independence and becoming a janitor. Her father escaped his village to get educated and thus survived the Great Famine. He became highly educated, but never joined the Communist Party . . . and was sent to a re-education labor camp because of it.The author herself grew up in China and immigrated to the United States as a young adult. She sought freedom and the American Dream, and found both. This book is about freedom-and about what happens when we let people take our freedom away. Helen Raleigh, CFA, DTM, was born and raised in Communist China. She arrived at America with less than $100 in her pocket. Through a combination of hard work and scholarships, Helen earned two master's degrees and worked for multiple Fortune 500 companies. Today she is a business owner, an author, speaker and a senior contributor to the Federalist.com. Many of her blogs can be found at helenraleighspeaks.com.